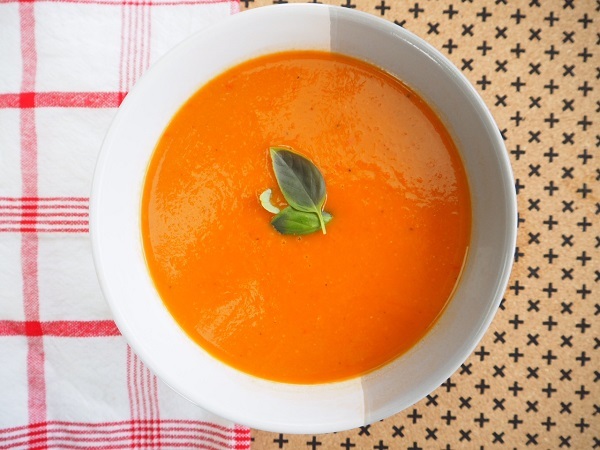 The use of the basil pesto in this tomato based soup makes it quick and easy to get a bucket load of flavour into it. It also requires no dairy to make it creamy as the addition of the potatoes makes this tomato soup thick with a creamy consistency. I have used canned tomatoes because they are super cheap and have more flavour than fresh which are quite expensive during Winter and not very flavoursome. Place all the ingredients into the Kambrook Soup Simple. Place the lid on, set to smooth (21 minutes) and let it do its thing. It will beep continuously when it has finished, remove the lid and you soup is ready. Store in an airtight container in the fridge for up to 4 days. Freezer friendly: pour cooled portions into ziplock bags and freezer flat for up to 3 months. Recipes created and shared by Amanda Voisey. Cooking For Busy Mums was founded 4 months after my first son was born in February of 2010 when I quickly realised that the meals my husband and myself had become accustomed too were a thing of the past. Meals would have to be quick, simple, cost effective, and dinner time made as hassle free as possible. I decided it would be great to share my recipes with fellow busy mums and create a community where we can all help each other with answers that were tried and tested as apposed to being "googled".